See a Business Value Identification Example (PDF). Keynote & Speaking – Available in 60 and 90 minute sessions. Learning Programs – Available in 2, 4, and 6 hour sessions. Your fast-paced corporate culture can disconnect employees from your organization’s mission, goals, and strategies. When your employees lose their connection to your organization, engagement plummets, turnover skyrockets, and your organization’s ability to achieve its strategic plans is at risk. As time passes, your employees’ relevance to your organization’s mission, goals, and strategies diminish. Before they can lift their heads up from their desks, your employees have become invisible and irrelevant. Increase engagement, improve productivity, and align employees with organization goals. 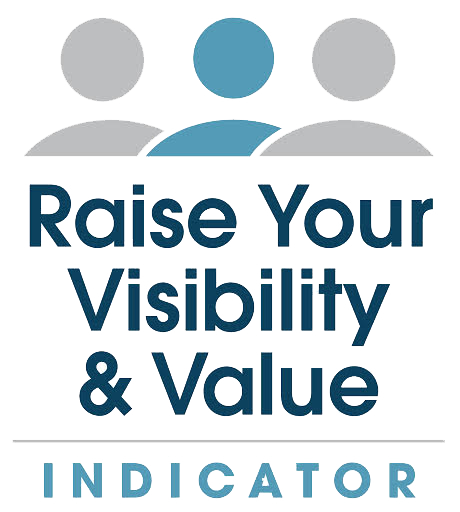 Learn more about the Raise Your Visibility™ Indicator (PDF).